Create something together or individually. Gain new perspectives by intuitively tapping into your creativity. It is a deeply fulfilling process-art experience for every person. 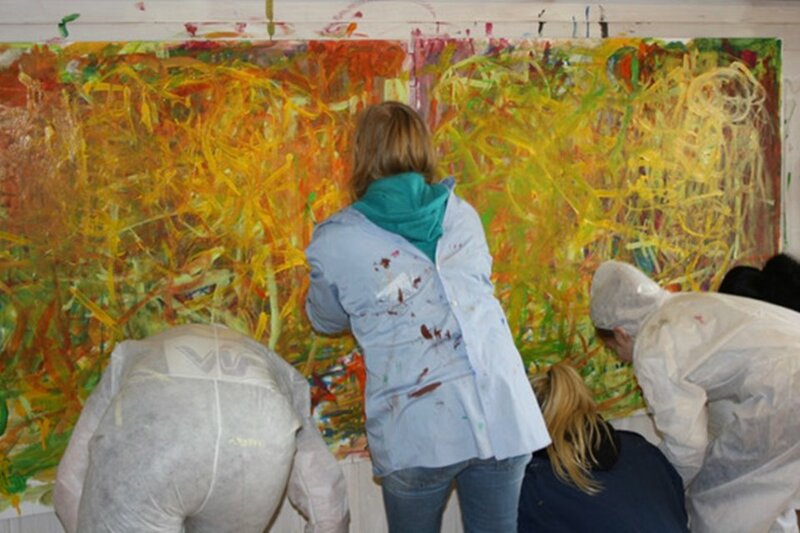 Painting collaboratively or individually facilitates dynamic interaction and dialogue. This process inspires “out of the box thinking” and the finished artwork is a symbol of your creative and expressive exploration. The tactic of beginning blindfolded releases the creator from competitive performance and aids us in our discovery of the flow of our brush stroke, what is referred to as your signature. This part of the workshop is accompanied by flowing instrumental music. After removing our blindfolds we will then review the nature of the work completed and it’s qualities. Next using our left hand only during the second phase we exercise our ambidexterity. This part of the workshop is accompanied by experimental music. During the final phase we will paint using only our right hand during 2 minute intervals encouraging your spontaneous nature. This part of the workshop is accompanied by bombastic music. This experiment takes place in my art studio and the participants work collaboratively or individually exploring creative process. Families, friends, corporate groups, everyone is welcome. This painting workshop builds community, fosters cooperation, eliminates competition, and most importantly is social and fun! Booking of corporate groups include apero and materials. You will work with professional materials and the completed masterpiece can hang in a communal environment. Please contact for prices. Borgarnes. It is 1 hour drive from Reykjavík downtown. You can get there by bus. Private transportation available upon request.